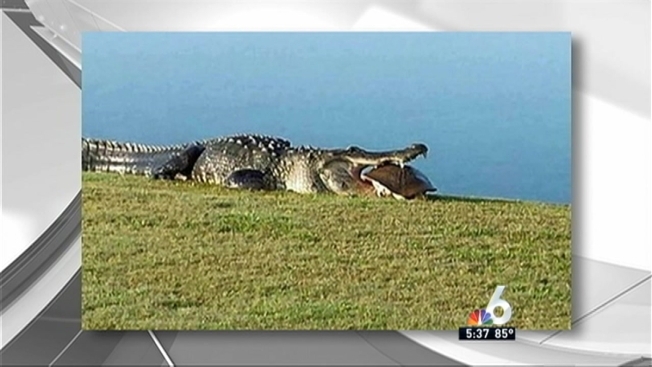 The giant alligator spotted at an Englewood, Florida, golf course is back -- and this time, he's hungry. The Myakka Pines Golf Course posted a new photo to Facebook Thursday of their famous resident -- a giant alligator affectionately known as "Goliath." This time, Goliath is chowing down on a giant turtle. "Sorta nasty to see, but it's the reality of wild animals," the club says on their Facebook page. 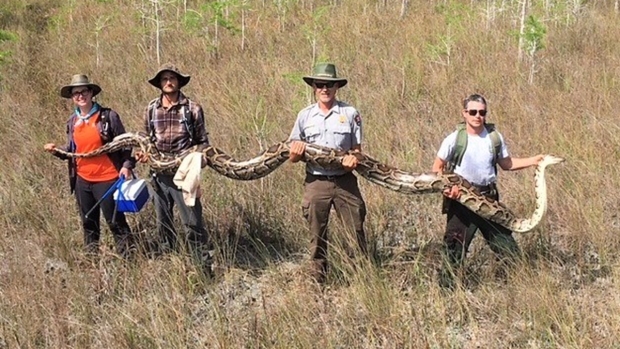 Mickie Zada, manager of the club, estimates that Goliath is at least 12 to 13 feet long. The reptile earned his name after the club polled fans on Facebook on what they should name him. The other choices were "Viral" and "Myakka Mike."